I have indicated in several Posts that during the 20th century we experienced one of the most serious epidemics of all time, that of coronary heart disease (CHD). Some readers have commented why I seem to be unique in defining CHD as an epidemic, but I have indicated a more recent acknowledgement of the epidemic from the USA. There is however a tendency to view life, and death, as stable and unchanging, with no appreciation of the past. Memories tend to be short,which is why we need good written records. An epidemic must have a clear onset, an increase to a peak, and then a decline. In respect of CHD we can identify a peak in about 1970 (slightly earlier in the USA), and there has been a well-documented decline. I have described this in previous Posts, identifying that the death-rate has declined dramatically. This has led to a great increase in the number of very elderly, these people having not died from CHD. The purpose of this Post is to define the onset of the epidemic. Many people assume that CHD has always been present, but this is not the case. When I was working as a recently qualified doctor in the years 1966-72, it was clear that we were experiencing a large workload of a very major illness for which we not prepared and which was obviously new. The mortality rate was very high. About 50% of those experiencing myocardial infarction (MI) died almost immediately. Of those surviving to be admitted to hospital, up to 30% died during their stay in hospital. The detail of the onset is hidden away in the UK national death statistics, and these were analysed by Dr Maurice Campbell. His work was published in two excellent papers in the British Medical Journal in 1963, but they seem to have had little or no lasting impact. A detailed account of Dr Maurice Campbell and his career is to found in the journal Heart. It was written by Dr Maurice Silverman, a consultant Psychiatrist colleague of mine for many years in Blackburn, UK. It makes interesting reading, giving a good account of Campbell’s major contributions to cardiology at the formative time of the introduction of cardiac surgery, specifically mitral valvotomy (the opening of a severely narrowed mitral valve). Campbell examined very carefully, in what is said to be his usual style, the records of the Registrar-General of Births and Deaths of England and Wales, which started in 1838. The earliest records that Campbell studied were from 1876. Campbell’s two papers covered the two periods of 1876 to 1929 and 1929 to 1959. He identifies that during the half-century of 1929 to 1959 a great deal of medical development had taken place. There was a much-improved understanding of disease process, of pathology. Consequently there was a refinement of medical diagnosis and of terminology. And therefore was a change in death rates from a given diagnosis the result of a change in disease incidence and fatality rate, or merely due to a change in nomenclature? Campbell felt that this was probably the case during the period 1876 to 1929, as during that time the total number of deaths from heart disease remained the same, and perhaps there was just a change of terminology within this large group. 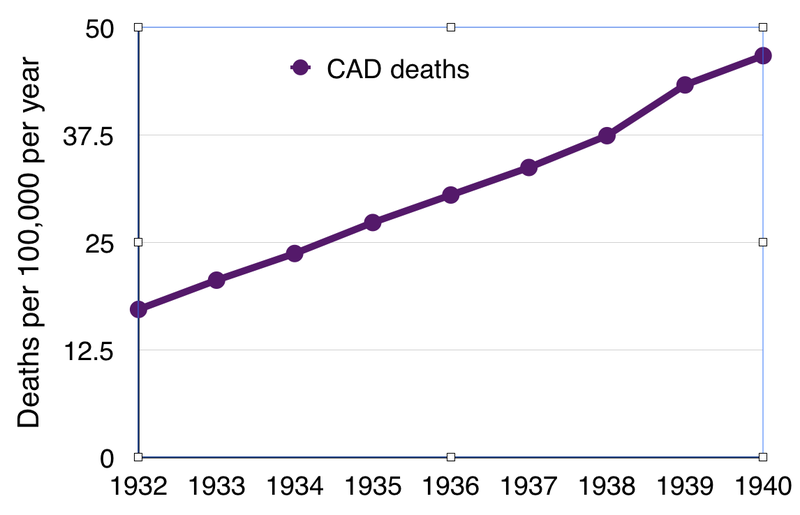 Deaths from infectious diseases (including tuberculosis) were falling in the first years of the 20th century, and so the proportion of deaths from heart disease inevitably rose, but not the absolute number of heart deaths per year. The data for this period comes from the Annual Report for 1910 and the Statistical Review for 1921. 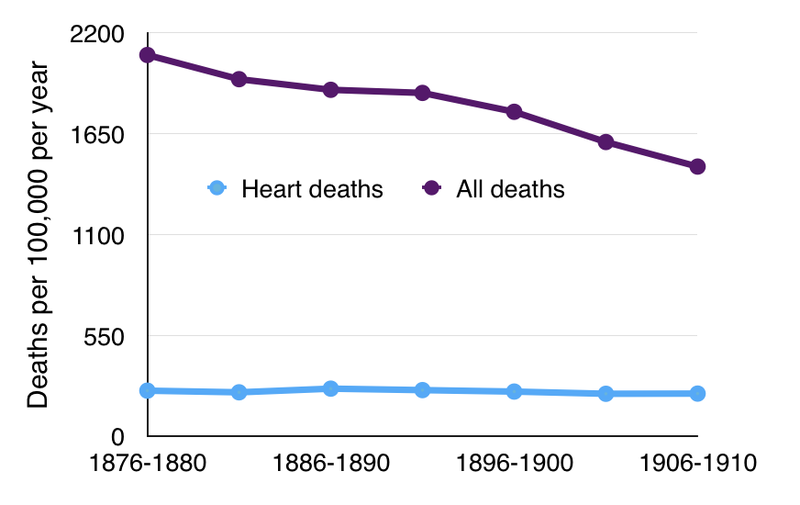 Between 1876 and 1906 there was a steady decline in the overall death rate of the population, but the number of deaths from heart disease remained constant. 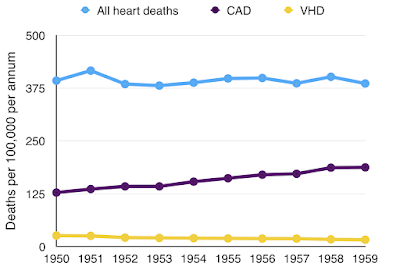 It is obvious that the proportion of deaths from heart disease increased, but actual numbers are much more important than proportions and percentages. The paper presented death rates per million per year, as from the data supplied by the Registrar-General, but in this and other Figures I have transcribed to deaths per 100,000, as is used today. It is interesting to look at other aspects of changing mortality. 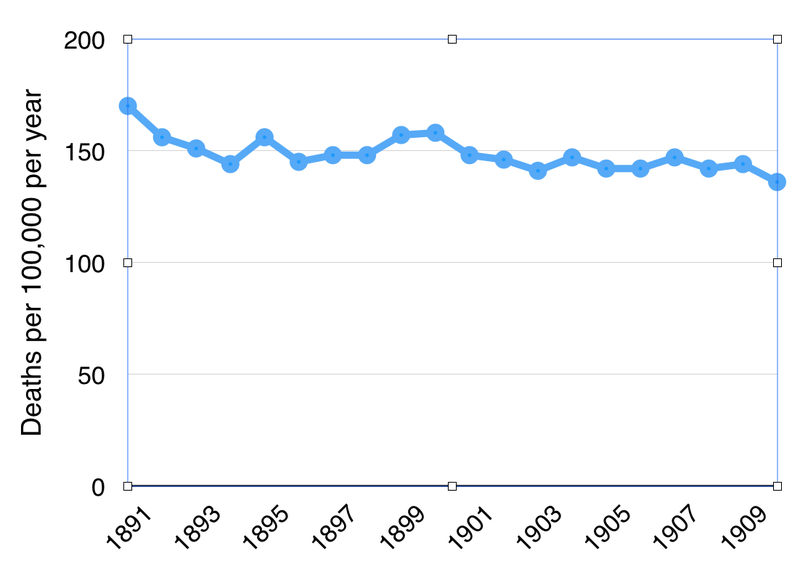 Deaths from tuberculosis (TB, then known as “phthisis”) were falling. The reason for this is not clear as it was not until 1952 that specific treatment became available. Presumably the reduction of TB deaths was the result of improving nutrition, general health and therefore immunity of the population. Deaths from bronchitis were also falling, perhaps for the same reason. 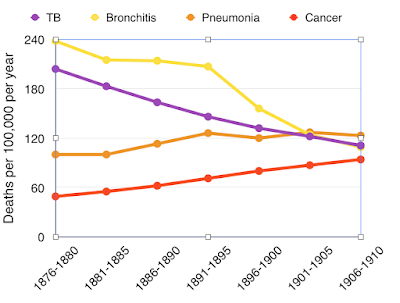 Deaths from pneumonia were increasing, perhaps a change of diagnosis from bronchitis. Deaths from cancer were increasing, perhaps due to improved diagnostic processes. 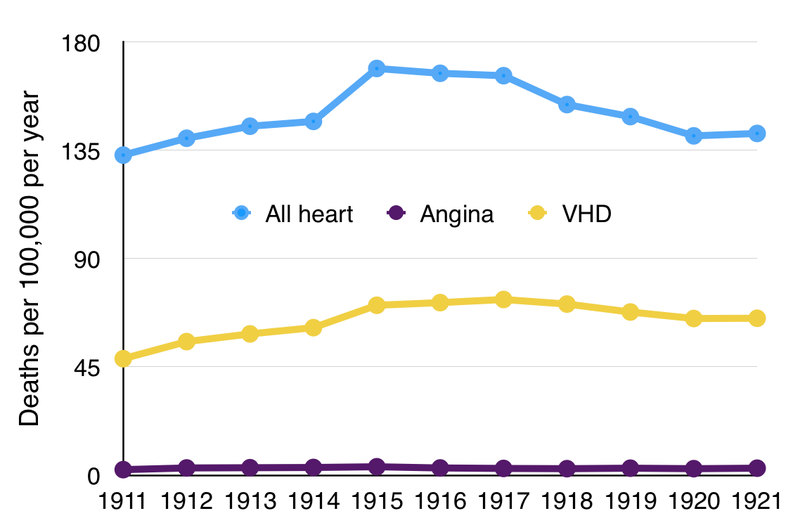 There was a slight decline in deaths from heart disease over the time period 1891 to 1910. The data for this period comes from the Statistical Review for 1921 and the Statistical Review for 1931. We still see little change. 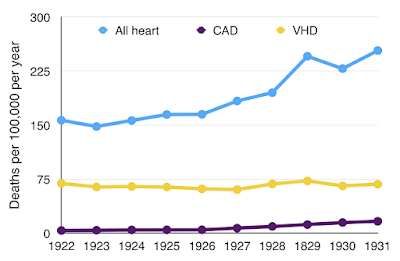 There was a slight increase in heart deaths during the First World War, for reasons not clear. This appeared to be the result of deaths from diseases of the heart valves (valvular heart disease, VHD), the result of earlier rheumatic fever that damaged in particular the mitral valve (this is situated between the left atrium and the left ventricle, and therefore damage severely impedes blood flow from the heart). The aortic valve could also be damaged in the tertiary stage of syphilis. “Angina” was used in the heart disease classification for the first time. It is chest pain related to exercise and the result of narrowed coronary arteries, a manifestation of coronary heart disease (CHD). Angina can also result from severe stenosis of the aortic valve of the heart. 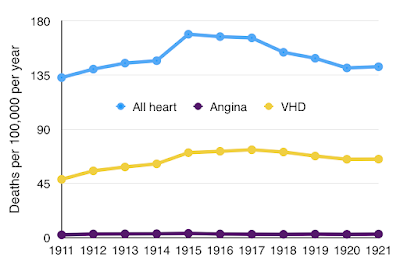 Angina certainly was a rare cause of death, just 3 per 100,000 and with no change during the decade 1911-1921. During this decade the number of deaths from all diseases of the heart rises significantly, from 156.8 to 253.5 per 100,000 per year. There is no increase in deaths from heart valve disease. But during this decade we see something new, and in retrospect it is the onset of the epidemic of coronary heart disease. The data from the Statistical Reviews use the new term “coronary artery disease (CAD)” but this equates to the term “coronary heart disease (CHD)”, used by Campbell and in popular use today. 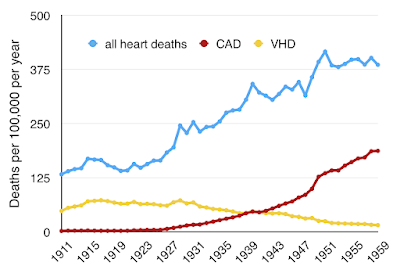 The increase of CHD deaths started in 1922-1924, but was most marked in the years 1927-1929. It was in the 1920s that the pathologists described coronary artery atherosclerosis with surface thrombosis leading to myocardial infarction (MI), death of heart muscle resulting from interruption of its blood supply. This is what we generally now call a heart attack; a new disease of coronary heart disease (CHD) was thus identified. The clinical and pathological description of CHD had first been published in 1912 by James Herrick (1861–1954) in the USA, just case reports (he also first described sickle cell disease, which was known as Herrick's disease). He presented his paper at the meeting of the Association of American Physicians, but in his words "It fell flat as a pancake". 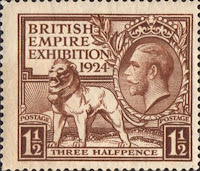 For several years few people took notice of Herrick's description of CHD, especially outside the USA, and in the UK it was not until the second half of the 1920s that further descriptions appeared. By this time the condition was becoming more common. This description is perfectly appropriate today. The changes of the previous decade continued. There was once again an increase in all heart deaths, from 231.6 to 341.6 per 100,000 per year. This indicates that there was a serious problem. 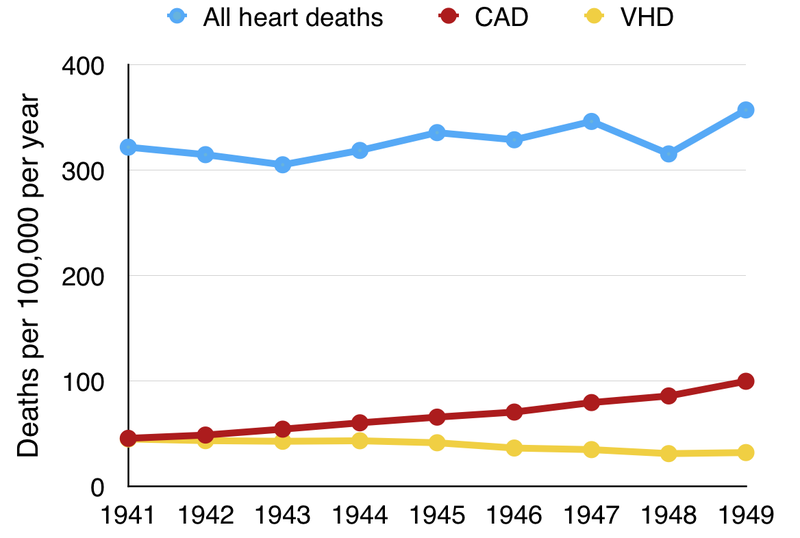 There was a slight decline of deaths from valvular heart disease, and a considerable increase in deaths from CHD. The data from this period was taken from the Statistical Review for 1940. 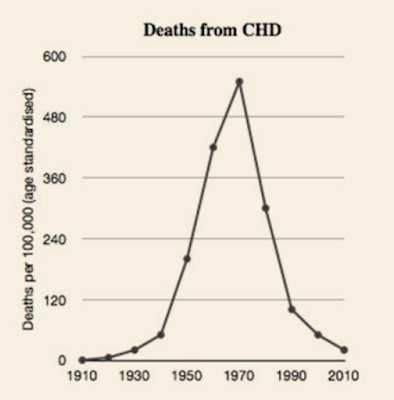 The deaths from CHD are isolated in Figure 8, and show an impressive change. 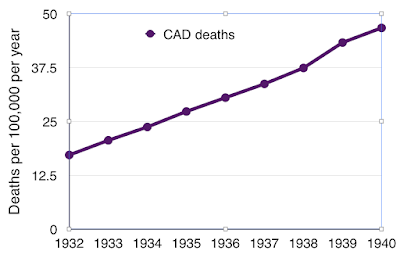 Between 1920 and 1940 the death rate had increased from 3 to 46.7 per 100,000 per year, sounding more impressive if expressed as a 15-fold increase, or 1500% increase. It is difficult to escape the conclusion that a serious epidemic was developing. At this time we were in The Second World War. Casualties on the battlefield and in the bombed cities were more important than a change in the causes of death in the nation, no matter how serious in retrospect. 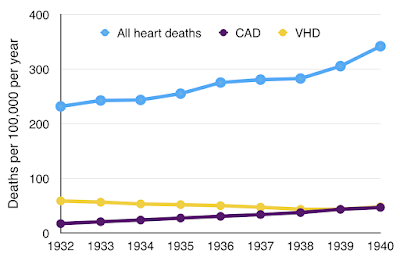 During this decade there was slight increase in deaths from heart disease, all causes, with a continuing decrease in deaths from VHD, and a continuing increase in deaths from CHD. By 1949 death rate from CHD had reached 100 per 100,000 per year. The data came from the Statistical Review for 1949. 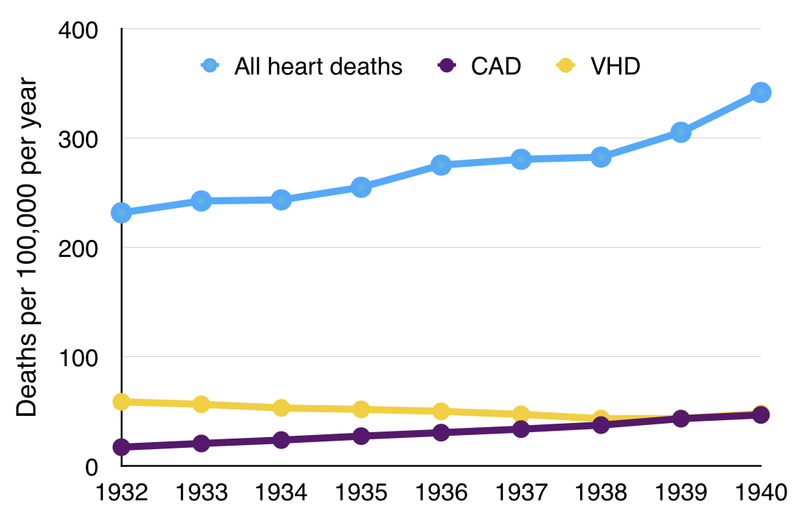 In view of the only slight increase in total heart disease deaths and small decrease in VHD deaths, Campbell suggests that the increase of CHD deaths might have represented in part an improving recognition of coronary heart disease. 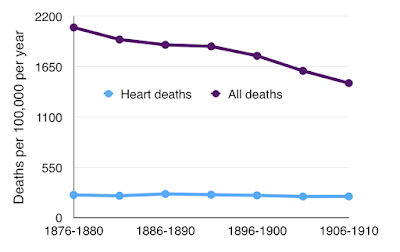 During this decade the death rate from heart deaths all causes seemed to stabilise. There was an increase in CHD deaths, now reaching 187 per 100,000 per annum, which would be 93,500 deaths per year in a population of 50 million. 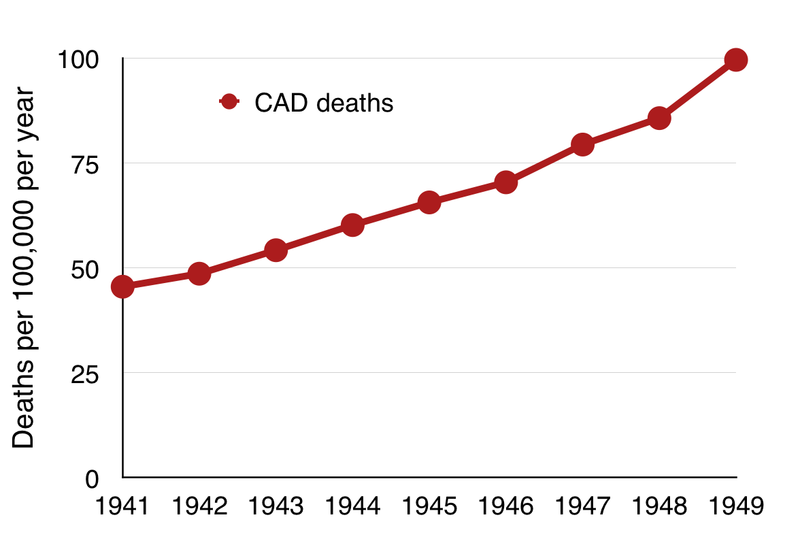 This should be compared to the 67,200 civilian deaths in the UK and its colonies during the six years of World War Two, so as to appreciate the impact on the population of the epidemic of CHD. 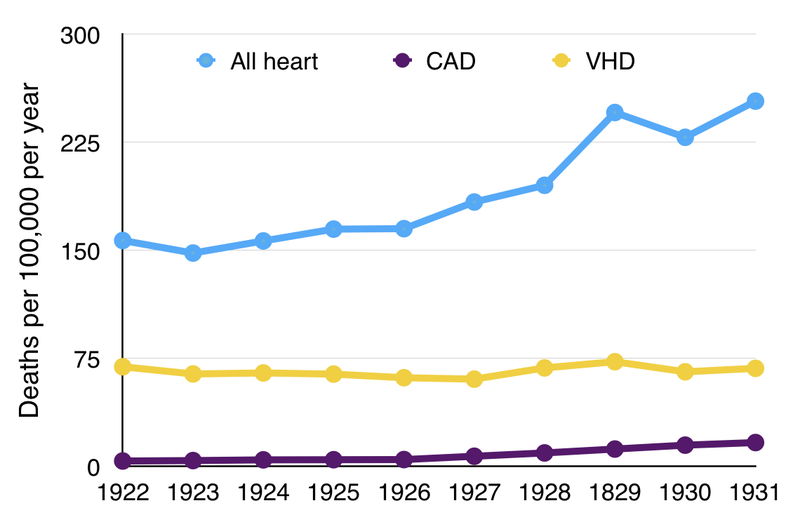 In Figure 13 we can see the development of CHD deaths during the years 1911 to 1959. 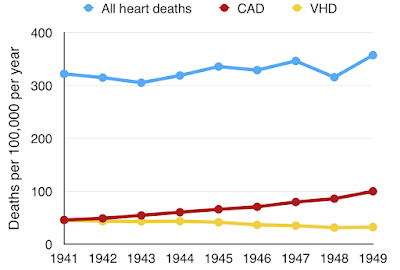 The increase in CHD deaths might to a certain extent be the result of improving diagnostic accuracy, but the matching increase in total heart deaths suggests a real change and the development of an epidemic. On the other hand, the reduction in overall population mortality rate was due to a major decline in deaths from infectious diseases, mainly in children. This has meant an increase in the number of adults who would be at risk of dying from CHD, even though it was obviously new. In his second paper Campbell expresses the view that the increase of heart and CHD deaths was the result of an ageing population. The major reduction of deaths from infectious disease in childhood (measles and gastro-enteritis in particular) meant that there were more adults, a greater proportion of the population. They would be at risk from CHD deaths whereas children were not. However in retrospect this explanation of the onset of the CHD epidemic cannot be true. In the early 21st century we have a population that is ageing very rapidly, especially those above the age of 90 or even 100 years, at a time when the epidemic of CHD has almost come to an end. 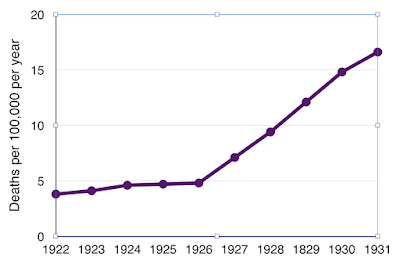 The ageing of the population in the first half of the 20th century was mainly due to the decline of childhood infectious diseases. 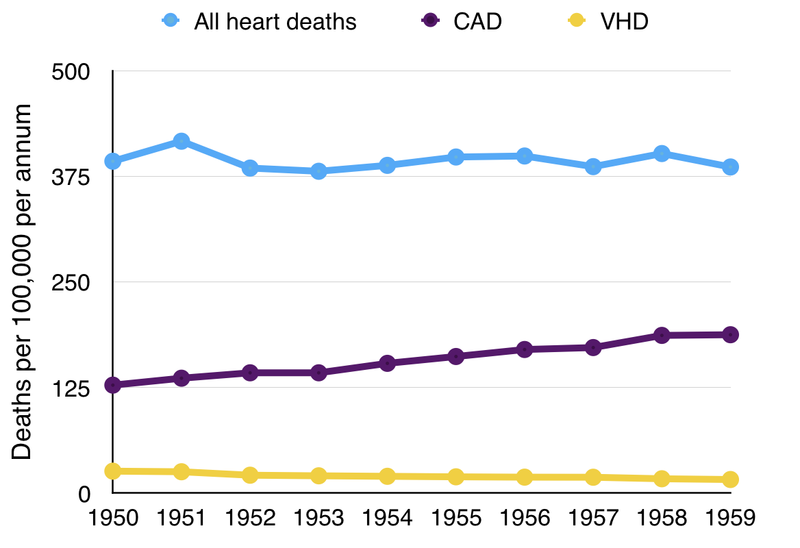 The ageing of the population in the past 40 years has been the result of the decline of CHD deaths. Campbell’s study ended with data from the Statistical Review for 1959. He felt that a plateau of heart deaths, and specifically CHD deaths, had probably been reached. However this was not to be. Death rates continued to increase, and rather than reaching a plateau of stability and constancy, CHD death rates in the UK reached a peak in about 1970, 550 per 100,000 per year. The total number of deaths from CHD would therefore be about 302,500 per year, more than a third of total deaths. In the USA the maximum death rate from CHD was 700 per 100,000 per years, and in Scottish men an astounding 960. After 1970 the death rate from CHD went into a steep decline. By 1990 (when statins were introduced) the death rate for men was down to 90 per 100,000 per year, and only 30 for women. This was a return to the death rate in 1948. The decline of the epidemic has been described in a previous post. 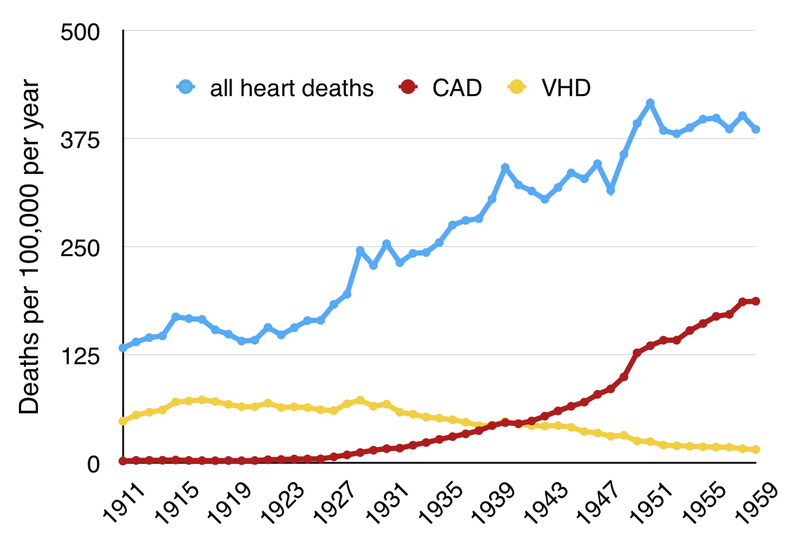 We have clearly witnessed in the “western” industrialised world an epidemic of CHD which was responsible for about 10 million deaths in the UK alone. This epidemic is now almost at an end. It was one of the most serious epidemics in recorded history. It was responsible for far more deaths than the notorious influenza epidemic of 1918 (228,000 deaths in the UK), but spread over a longer period of time and therefore with a less dramatic impact. Silverman ME. Dr Maurice Campbell. Heart 2003; 89: 1379–1381. 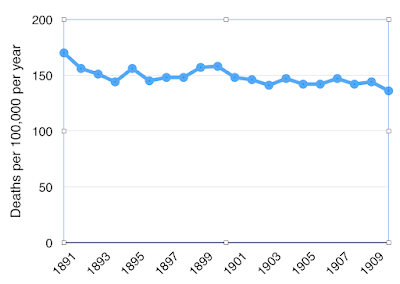 Campbell M. Death rate from diseases of the heart: 1876 to 1959. British Medical Journal 1963: August 31st.p 528. Campbell M. The main cause of increased death rate from diseases of the heart: 1920 to 1959. British Medical Journal 1963: September 21st. page 712. Osler W. “Principles and Practice of Medicine”. 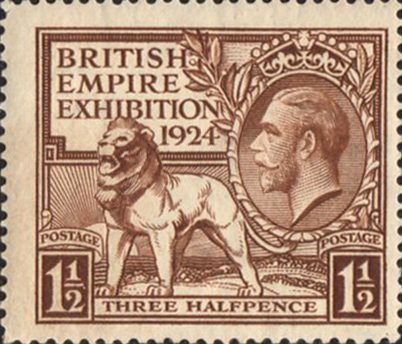 Appleton Press, London 1912: p836. Gibson AG. The Lancet 1925; December 19th p 1270. I mean. Females also get it, but usually later in their life. 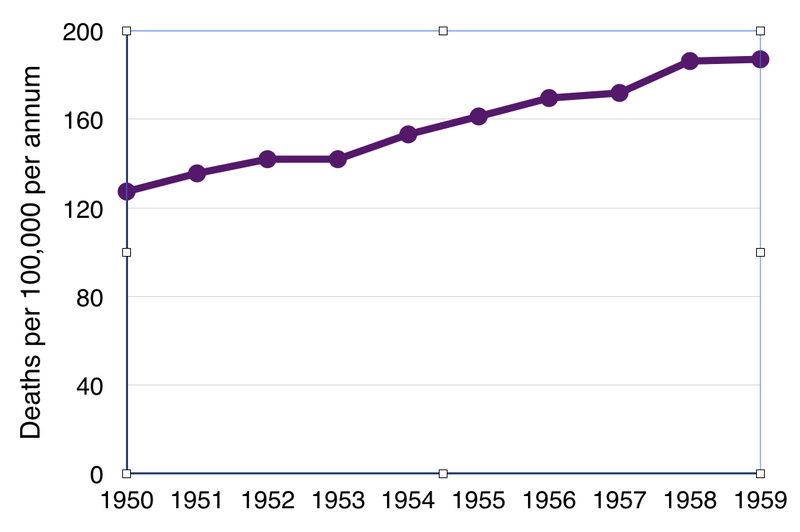 Compute the ratio of male deaths / female deaths at agegroup 45-64 or such. But this ratio shows also, that the "epidemic" is not over, the ratio is still high.